With a minimum of words, Maxine Beneba Clarke gives us a peek into life in an African village and the irrepressible energy of the children who live there. Our unnamed stars take us on a personalised tour of their world and their ingenious creation. The parts they use to cobble together their vehicle gives insight into what they do and don't have. Vann T Rudd's illustrations dig deep to reveal the heart of a place most Westerners cannot imagine. Despite the fact it isn't mentioned, every page shouts of dry dusty conditions. Buckle up for a different sort of adventure deep in the heart of an African village. There might not be a shop or even a tap nearby, but there is plenty of fun and adventure. 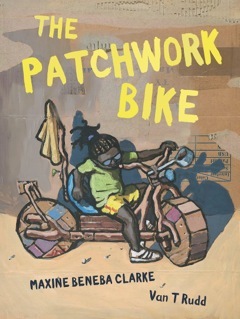 The Patchwork Bike is a keeper, not only for the sheer joy of story but also for the conversations it will trigger: about life in Africa, the irrepressible joy of children despite their lack of commercial possessions and the satisfaction of recycling.